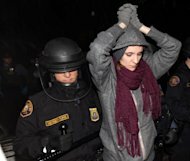 (AP) — Police arrested about 30 anti-Wall Street protesters in Portland early Sunday, dragging and carrying them to waiting vans, after they refused to leave a park in an affluent district. The arrests came after protesters from the Occupy Portland movement marched to the Pearl District, with some saying they viewed its residents as part of the wealthy demographic they're protesting. Dozens of them gathered in Jamison Square Saturday evening to defy a midnight curfew to vacate. As police moved in around 2 a.m. most of the protesters backed off but a core group of 27-30 sat in a circle in the park and awaited arrest. An Associated Press photographer said most of the protesters went limp and police carried or dragged them away. There was no violence during the arrests, which took about 90 minutes. The protesters — all appearing to be in their 20s and 30s with many were wearing Halloween-style face paint — were handcuffed before they were place in police vans and driven off. "We are the 99 percent," one arrestee continued to chant. The crowd of supporters thinned out around 3:30 a.m. as the last arrests were made. Police said they arrested more than two dozen people on charges that included criminal trespassing, interfering with a police officer, and disorderly conduct. I use to be a Law Enforcement Officer, and they have NO INTEGRITY and dont derserve to wear the badge! It disgust me to see what they are doing. There's NO HONOR and intimidating and harrassing unarmed people caring out their God given right to assemble peacefully under the 1st Amendment! To the Law Enforcement in Oakland you are bought and paid for by the Corporate Elite, and represent the 1%! Just keep telling yourself after you beat or tear gas unarmed people. I'm just doing my job. The Nazis also stated this as they killed millions of unarmed people!